It’s no wonder that the Outer Banks of North Carolina is on The Knot’s list of top US destination spots. 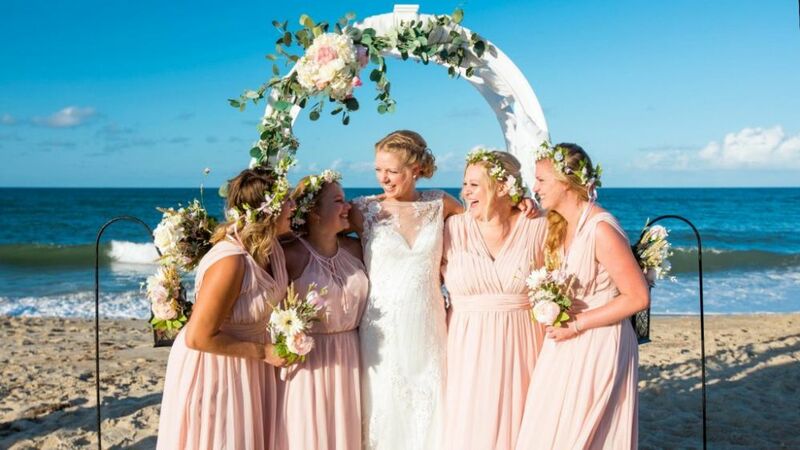 The Outer Banks is home to a large wedding industry compiled of skilled photographers, master chefs and catering companies, scenic views and more. Numerous OBX vendors are excited to meet you this weekend at the Outer Banks Wedding Association 2019 Expo, including the Sea Ranch Resort! The Sea Ranch is going to be an OBXWA tour stop, so please stop by and see our event space after the wedding expo on Saturday! We will have champagne and hors d’oeuvres for you to enjoy while exploring our event space. Why choose the Sea Ranch Resort for your Outer Banks Wedding? The Sea Ranch lives on an oceanfront location with a gorgeous view perfect for your OBX beach ceremony! At the Sea Ranch, you can have a beautiful ceremony with indoor reception accommodations for your reception at an affordable rate. The Sea Ranch offers a few different package options for your ceremony and reception. If you already have your reception booked but are looking for a ceremony location, our ceremony only package may be the right choice for you. Our ceremony package also includes 20 white folding chairs, an arbor, sheppard’s hooks with lanterns, and a sand ceremony table. The Sea Ranch Resort also offers a reception space within our 2000 + sq. ft. partial oceanview event room, protected from potential inclement weather. The Beachside Bistro can also be used for larger events if available. The event rental fee includes standard round tables and chairs, tablecloths, napkins, and dishware for your convenience. The Sea Ranch extends plated dinner catering options for your event. We have put together catering menus for inspiration, however our executive chef is more than happy to work with you on customizing your menu for your event. Are you visiting for the wedding expo weekend? The Sea Ranch Resort is offering a discount for expo weekend attendees! Book an oceanfront room for $99 or our main building rooms (no view) for $60. Both rates include breakfast for two.